Grow sweet corn in a spot that receives plenty of sunshine, in soil that’s been enriched with a lot of well-rotted organic matter such as compost. Corn’s lofty habit and feathery tassels makes it an attractive plant in its own right. Corn loves the warmth and won’t tolerate frost. While the seeds may be sown directly outside once the soil has warmed up, the safest way to sow is into pots in the protection of a greenhouse, hoop house or cold frame. That way you can begin sowing three to four weeks before your last frost date and enjoy a head start on outdoor-sown corn – a huge advantage in shorter growing seasons. 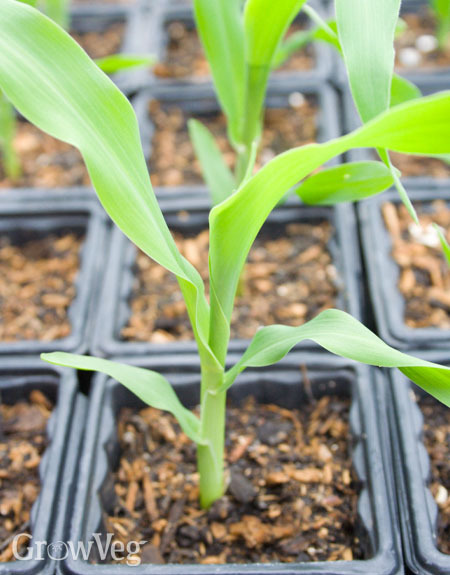 Sweet corn is wind-pollinated, so instead of planting them in a long row, set your plants out in a block for the highest chance of success. If the corn isn’t well pollinated, it will still grow but will be missing many of the kernels from the cob. Sprawling squashes make a great companion for sweet corn. The squash will carpet the ground and help suppress weeds as the sweet corn grows skywards. Remove any weeds that pop up within your sweet corn by hand and continue weeding while you are still able to get between the plants. Sweet corn is sturdy and shouldn’t need supporting. It will appreciate watering in very dry weather, particularly from late summer as the tassels appear and the cobs begin to form. Do you know there are even some gardeners who swear by getting a pan of water on the boil before harvesting their corn so it can go from plot to pan in mere seconds? If you have tips for growing or enjoying super sweet corn, then please share them in the comments section below. "Does sweet corn have suckers? Each stalk has 2 stalks coming out. Don't know whether to remove or.leave them.Never seen this before." "Hi Breysach. Yes, sweet corn can produce suckers, which are called 'tillers' on corn. They're actually a sign that the plants are growing in good conditions, though can sometimes come about if plants are injured or damaged in some way, perhaps by hail or insect damage. Whether you leave them or not depends on your growing season. The tillers have the potential to grow on into full-sized stems, which may even produce bonus ears of corn, though this is very much down to chance and how long your summer is. You do not need to remove tillers - just leave them be. They aren't harming the plants and removing them risks harming the main stem. Let them grow on - they may come away naturally, or they may grow on to boost your harvest. Either way is fine." "Can I use kernels from a store bought cob as seeds for next year's crop?" "You could dry the kernels out to then store as seed, but the trouble with that is that the resulting seedlings may not come true to type - i.e. they may produce cobs nothing like the ones you bought. This is because a lot of commercially grown corn in hybridised, which means the seedlings are not like the parent plants because new seed must be specifically produced by crossing two types of parent plants, each and every season. There is also the risk that cobs may have been treated some way to extend shelf life, thereby compromising viability of the seeds. It's always best to start from seed sold specifically for sowing." "can you plant early variety sweetcorn with a later one next to each other." "Hi Gillian. If you mean side by side, rather than interplanted in the same patch of ground, then yes, absolutely. They may flower at different times. And even if they do flower at the same time and cross-pollinate, this won't affect the quality or distinctiveness of the final cobs. Only if you were to save seeds to sow next year would you potentially come across problems. So yes, if it's simply to eat both this year, go for it. Absolutely, yes, no problem. The blocks of sweetcorn would need to be physically separated "